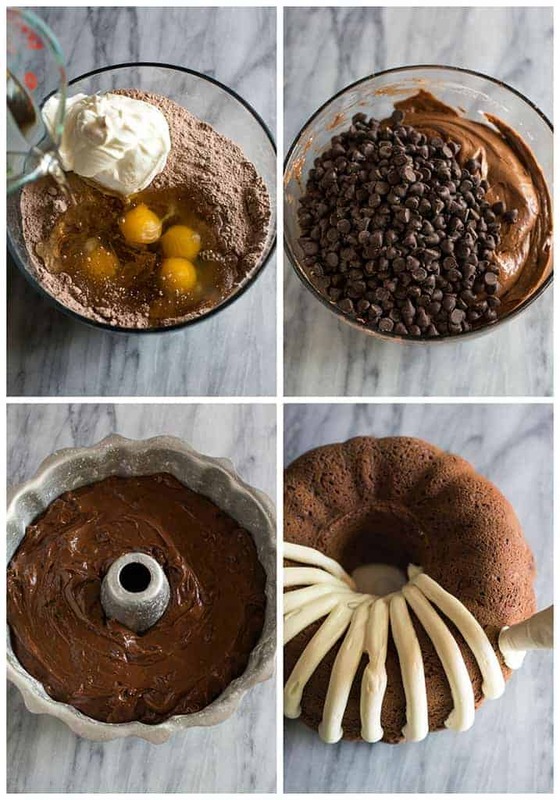 A Nothing Bundt Cake recipe that is a perfect copycat of the chocolate chocolate chip bundt cake at Nothing Bundt Cakes. Serve this for birthdays, baby showers, weddings, or any occasion! Bundt cakes are one of my favorite dessert recipes to bring to a party or shower. I love how easy they are to make and that I can make them ahead of time. Check out my popular Red Velvet Bundt Cake and Chocolate Macaroon Bundt Cake. A ten-inch bundt cake from the Nothing Bundt Cakes store costs more than $40! 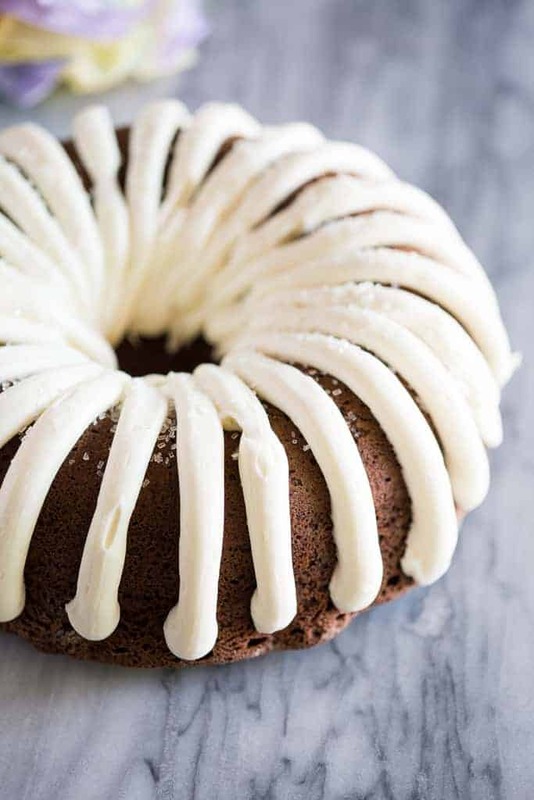 This homemade Nothing Bundt Cake takes just a few minutes to whip together, is super cheap, and the end result if both beautiful and delicious. You’ll notice the ingredients in this cake use both a cake mix and a box of instant pudding. This cake is one of the “from scratch” exceptions I make because I think it tastes every bit as delicious as a homemade cake. However, you can use my homemade chocolate bundt cake recipe to make a chocolate bundt cake from scratch. 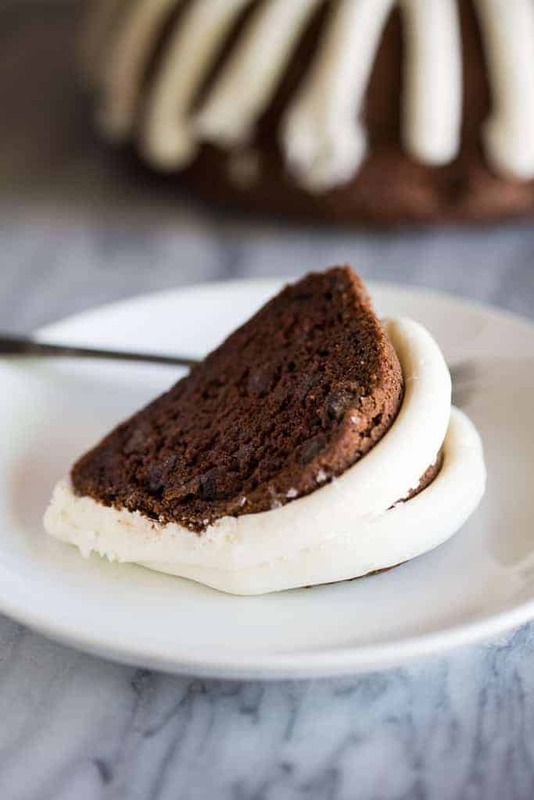 You can add chocolate chips to it and use the same cream cheese frosting. I’ve tried so many methods for getting bundt cakes to come out of the pan without sticking, and the one method that works for me EVERY time, is greasing the pan appropriately with shortening and flour. Start by spreading a very thin layer of shortening all over the pan. I use a ziplock sandwich bag, stick my hand inside of it, and use my hand to smooth the shortening all over every bump and crevice in the pan. This way I can make sure the entire pan is covered evenly, in a thin layer, and my hands stay clean. Next I get a little pinch of flour and dust it over the pan. Hold the pan over the sink and tap it hard, in a circular motion, all around the edges so that the flour lightly covers the pan. Now you’re ready to add the cake batter, and rest assured the cake will come out of the pan without sticking! 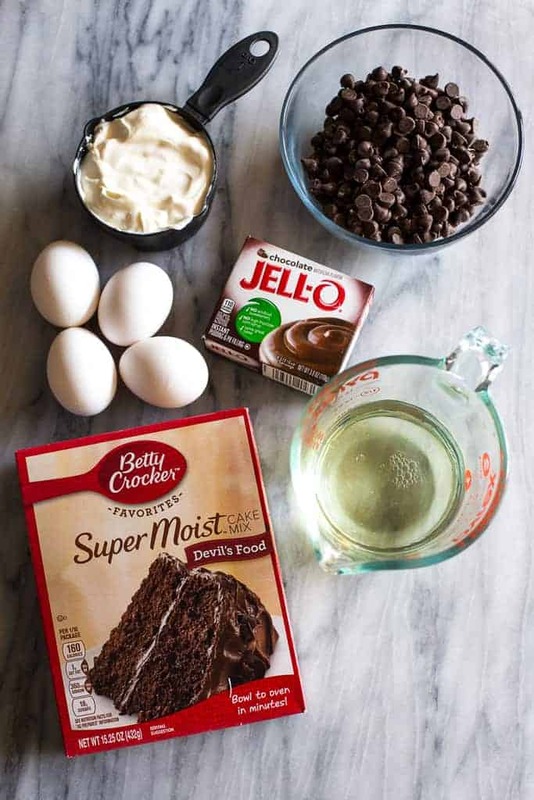 Mix together the cake mix, chocolate pudding mix, eggs, sour cream, water and oil. Stir in the chocolate chips. 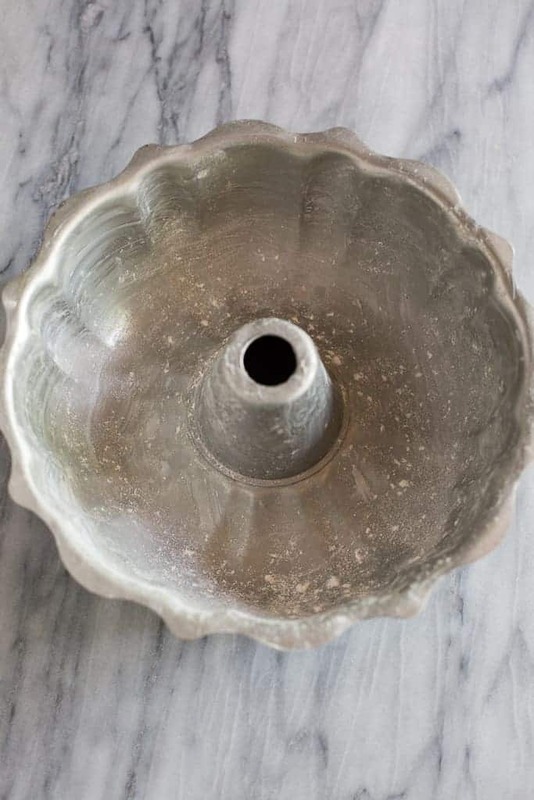 Grease the bundt pan with shortening and flour (see my tips for this, below). Add the cake batter. Bake at 350 for 45-50 min or until a toothpick inserted into the center of the cake comes out clean. Allow the cake to cool in the pan for 10 minutes, then invert it onto a wire cooling rack. Once the cake has cooled, prepare the frosting. I use a pastry bag with a coupler inside, (and no piping tip), to pipe the frosting. If you don’t have a pastry bag, add the frosting to a ziplock bag and cut a hole in the corner. Start at the outside edge of the cake and drag a line of frosting up and over the top of the cake, into the center hole. Nothing bundt cakes stay fresh in the refrigerator, covered, for up to 5 days. I also love these cakes because they’re very freezer friendly! To freeze the cake, put it in the freezer for about 5 minutes, uncovered, to set the frosting. Cover it really well with plastic wrap and then tinfoil and freeze for up to 3 months. To thaw, remove the cake from the freezer and allow it to come to room temperature for about 1 1/2 to 2 hours before serving. 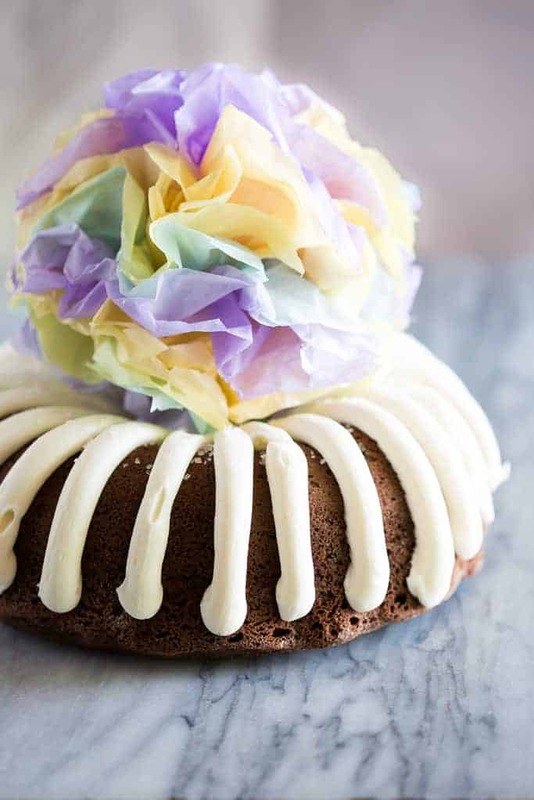 Nothing Bundt Cakes are also popular for having a cute flour or tissue paper ball in the center of them for decoration. 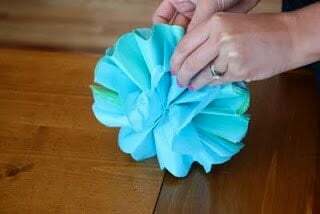 I’ve included instructions to make a tissue paper pom pom ball, at the bottom of the post. Mix the first six cake ingredients together. Stir in the chocolate chips. Pour batter into your greased bunt cake pan. Bake at 350 for 45-50 min. Allow to cool in the pan for 10 minutes before inverting the cake onto a wire cooling rack. I also like to run a butter knife gently around the edges of the pan to make sure the cake isn't sticking, before I turn it out. Beat together the cream cheese and butter until light fluffy. Mix in the vanilla. Gradually beat in the powdered sugar, mixing for several minutes, until smooth and creamy. Add more powdered sugar, to taste, if needed. Spoon frosting into a pastry bag with no tip attached, or into a ziplock bag, with the corner cut. Starting at the outer edge of the bundt cake squeeze and pull a line of frosting up and over the cake, into the center hole. Repeat this process all around the cake. Store, covered, in the fridge for up to 5 days. Freeze, covered well, for up to 3 months. 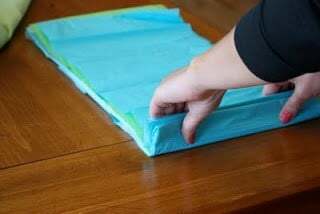 Cut 8 pieces of regular sized tissue paper in half, long ways. Stack tissue paper. Make 1 1/2 inch accordion folds. 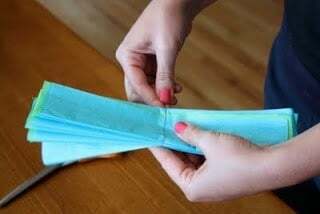 Fold a piece of floral wire in half, and slip over center of folded tissue; twist. 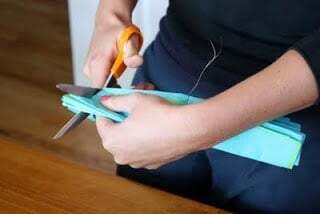 Use scissors to trim ends of tissue into rounded or pointy shapes. Separate layers, pulling away from center one at a time, until your pom pom ball is formed. Place ball on top of cake! *I originally shared this recipe May 2011. Updated April 2019.